Niagara Falls has nothing on Iguaçu Falls. 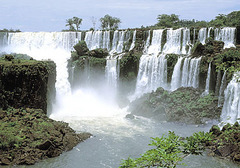 The waterfall system consists of 275 falls along 2.7 kilometres (1.67 miles) of the Iguaçu River. Most of the falls are about 210 feet in height, and the average water falling over Iguaçu in peak flow has a surface area of about 40 ha (1.3 million ft²). The falls were also featured in Indiana Jones and the Kingdom of the Crystal Skull.